Ideal for studying collisions in two dimensions, these pucks can be supported on plastic beads or levitated with air from the balloons to reduce friction. Use on any smooth, flat surface. The pucks measure 10 cm in diameter, and one puck is twice the mass of the other two. 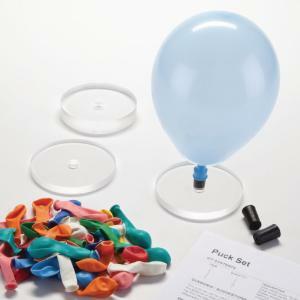 Includes three precision machined pucks, six balloons, three rubber stoppers, and instructions. /!\WARNING: CHOKING HAZARD–Small Parts. Not for children under 3 yrs.